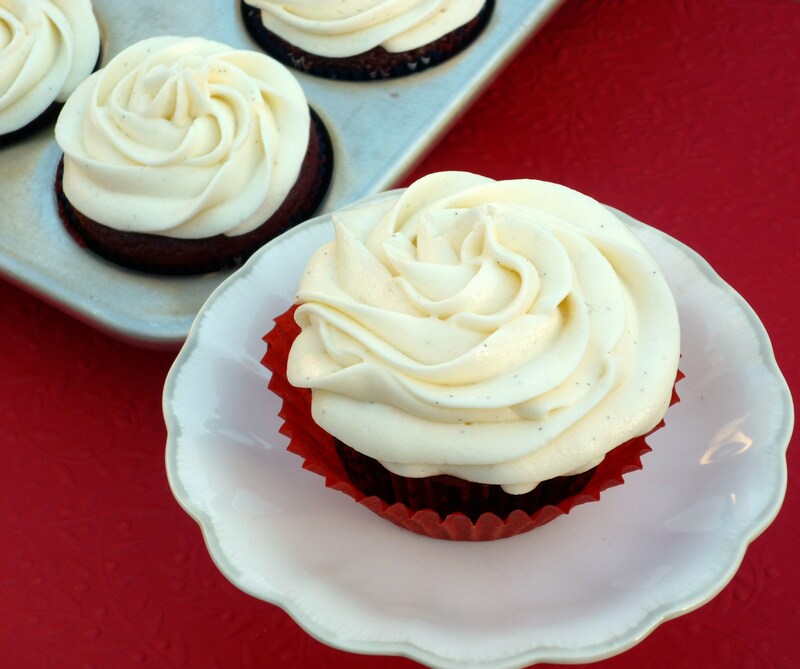 Red Velvet Cupcakes with Cream Cheese Icing … a favorite for so many people. Now, true confession time … I don’t know how to say this, so I’ll just get straight to the point … Red Velvet is not my favorite cake. There, I said it! We are all entitled to our own opinion … right? Please don’t hate me … I realize that I may be the only person on earth that feels this way. Let me clarify, I don’t dislike red velvet … I find to be OK … it’s just not my first pick. I have tried to love it … I’ve had red velvet at several bakeries, made by friends, etc. … but honestly, I found all of them to be OK, but they didn’t turn me into a lover. It’s my problem … no one’s fault. I have used red velvet cake mixes several times and thought the results were fine … they didn’t turn me into a red velvet lover. I really want to fit in .. and be a red velvet lover. I gave it another try … made a few changes to a cake mix, which created a moister and more flavorful cake. I’m on my way to be a red velvet lover … I’m not going to give up! Preheat oven to 350°F. Place paper liners in cupcake pans. Using a large mixing bowl, beat eggs slightly with an electric mixer. Add buttermilk and oil, stir to combine. Add cake mix and cocoa powder. Break up any large lumps of cake mix. Beat on low for 30 seconds or until moistened. Scrape sides of bowl. Beat on medium speed for 2 more minutes. Bake for 15 – 20 minutes. Cool completely on a wire rack. 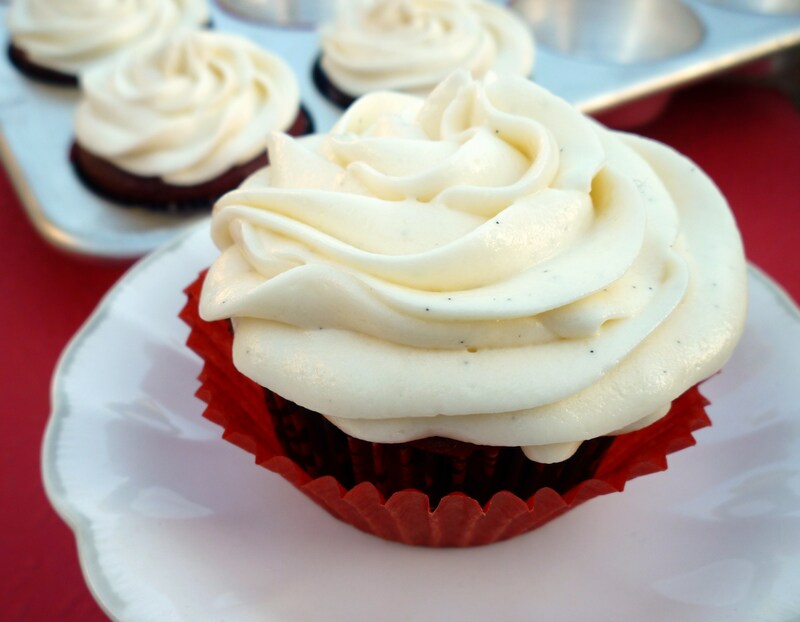 Using and electric mixer – beat butter, cream cheese and vanilla until combined well. Add 1/2 of the sugar and beat well. Add remaining sugar and beat on medium speed until creamy. Enough of my opinions … what’s your opinion? Are you a RED VELVET lover? I love that you voiced it! I am a regular baker too (my with blog below :)) and I also don’t really get the red velvet. I LOVE the colour and the way it looks, but give me a plain choc or vanilla with cream cheese any day… or lemon!! The icing certainly is well done. Tips are amazing and give cupcakes (and cakes) such a professional finish. great! Thanks you – only 1problem, can not get any red velvet mix in my part of the world. Suggest alternative. I love red velvet cakes, your version sould delicious. They look so pretty! I don’t think I’m a red velvet lover either. I’ve tried it a couple of times and don’t remember it to be amazing or anything. (And the amount of food coloring freaks me out.) Lol.